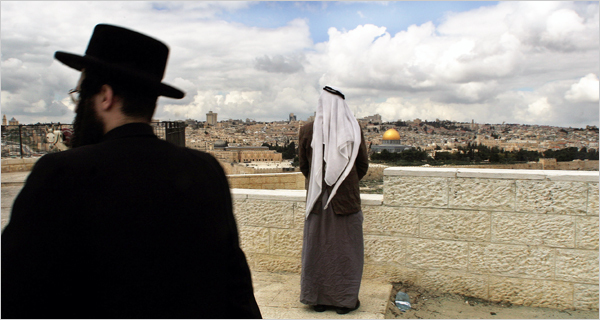 "Sharing sovereignty of political territory is not practiced often, yet it seems to be the only reasonable solution for the complex issue of Jerusalem. Using the holy places of Jerusalem as a model, the author shows how sharing sacred space, albeit on a very small scale, can be done peacefully. For more than a century Greeks, Latins, Armenians, and Copts have shared the Church of the Holy Sepulchre in an interlocking system of scattered sovereignty. Such a system also could work between Israelis and Palestinians as they share the sacred space of Jerusalem. If Israel continues to maintain control over all the land of Israel/Palestine, of course, then there is no need to discuss sharing Jerusalem. But in anticipation of the day when there most likely will be some form of Palestinian entity in existence side–by–side with Israel, and knowing that both peoples claim the city as holy and as their capital, then somehow the two nations have to agree on how to share the city. Ideally, the Israelis and Palestinians should sit down and demarcate control, because they are the ones who best know the facts on the ground. Given the imbalance of power between the two parties, however, perhaps the United Nations or the United States could play the role of arbitrator, like the Ottomans did in the past." Chad F. Emmett (1997). 'The Status Quo Solution for Jerusalem.' Journal of Palestine Studies 26(2).